The Boston Marathon is only 2 weeks away. Newcastle was to be my last training run. I just wanted to get out, enjoy myself, and complete the course in around 4 hours. The course is designed so that the start of the marathon (and the 10k) is nowhere near the start line. So Richard (who was running his first marathon) and I parked roughly midway between the two, and wandered up towards the start line. We arrived about half an hour early, at 5.30am. The race was due to start at 6am. The first thing I noticed was there were no portaloos at the start line. Runners needing a toilet were directed a long way back down the hill to the public toilet block at the bottom. I milled around, looking for my fellow Striders. I also saw Ray “Eagle” at the start, ready to run his 6th marathon for the year, bringing his total up to something crazy like 178. Night Striders at the start line. At 6.15, the race briefing began. Runners began to shuffle towards the imaginary start line, as there were no starting mats in place. This was also true for the other races, including the 10k, which drew close to 1500 participants. Runners were told to get close to the start line if they were ‘serious’, and wanted an accurate time. Hey Mr Race Director: you don’t need to be the fastest runner out there to be serious. 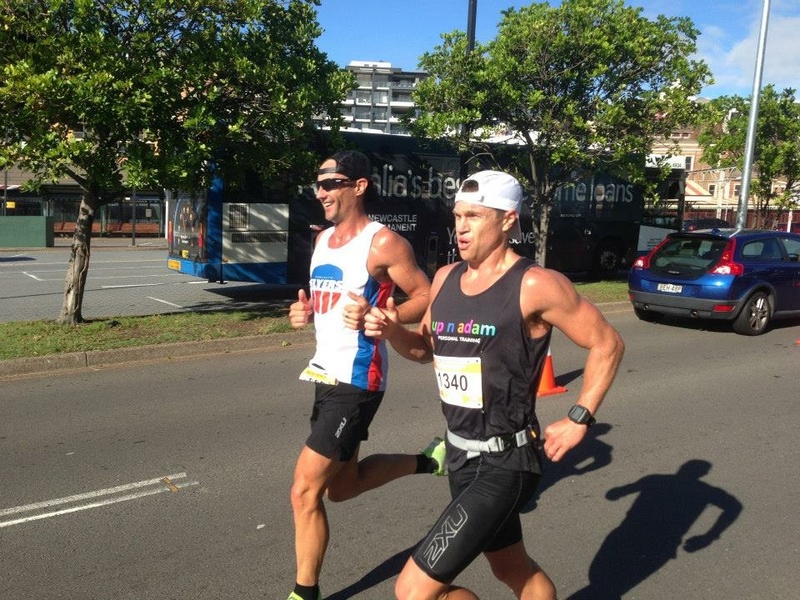 A PB is a PB, whether you are running a 33 minute or a 65 minute 10k. The race was ceremoniously started by Alan McCloskey, winner of the 1987 marathon, nearly half an hour late. 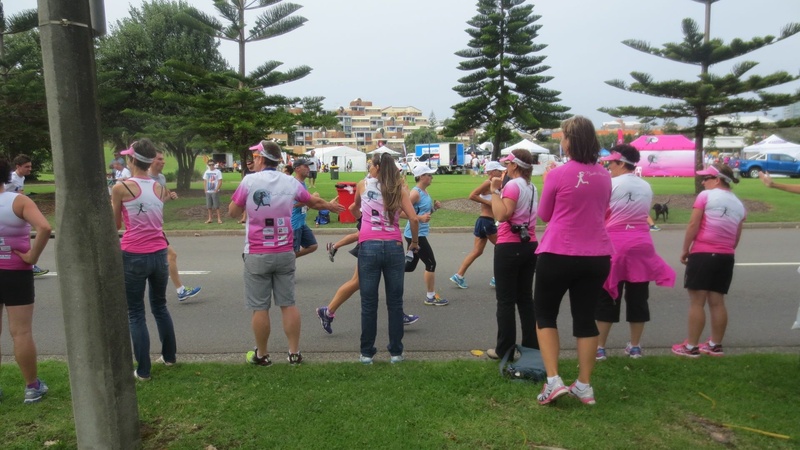 Nearly 300 runners took off out of King Edward park and down Memorial Drive. At Bar Beach, runners made a dead turn, and headed back up memorial drive, the only really significant hill of the course. We then crossed back over the start line, and meandered down through King Edward park, past Newcastle beach, Nobbys beach, and along honeysuckle. I really enjoyed this 10km stretch of the course. 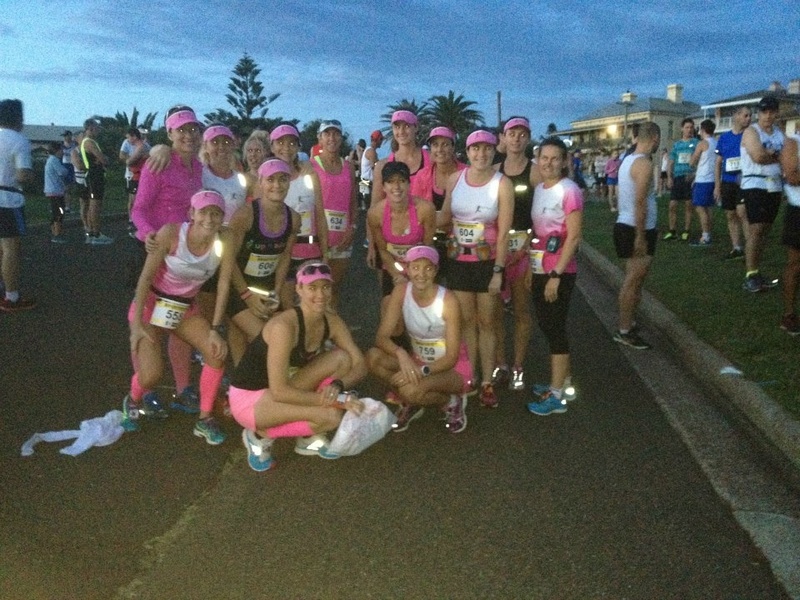 I ran along with other groups of night striders, including Tracey, Kate, Megan, Hayley and Kelly. All were doing their first marathon. Down the hill, up the hill. At the 10k mark, I had my first gel, chased by water from an aid station. At the next aid station, I went in search of electrolyte, only to find there was no electrolytes provided on any aid stations, as was advertised on the event website, just mix-up cordial. Not ideal. The course continued to wind around the back of Carrington, and then out onto industrial drive. At this point, I was running with Hayley and Kelly. We passed the race leader, running back into town. Time to start counting. 2nd, 3rd, 4th, and then up ahead I saw Rich, aka Triathlon Ken, running with Adam in 5th/6th place and looking good. Triathlon Ken, aka Rich, and Adam. Or, the master and the apprentice? Guess who is who. As we ran out towards the turnaround, we passed Hayley and Kelly’s families, standing near the intersection of George and Selwyn Streets. This turned out to be a great place for spectating, as we started to do a series of loops, passing that same corner again and again at kilometres 17, 18, 19, 21, 22 and 23. The team Peto/Arnott support crews. High fives all around! As we made the first dead turn, I saw that Pip, Kellie and Darlene were not far behind me, so I slowed down and waited for them. Pip was looking for a toilet, and was disappointed there was not one in sight. We passed Helen, looking strong, and knowing she was ahead of me was how I figured out where to go next on the loopy section of the course. The race Marshall’s didn’t really have much Idea what was going on or who was going where. Jokingly, I told one Marshall I was on my 3rd lap, and asked where to go next. He pointed to the left. Lucky I knew where to go, and that I was only supposed to do 2 laps of that section, because the officials clearly had no idea. I felt sorry for any out of towners who were not familiar with the course. At this point of the course, later in the race, apparently runners were re-directed from the 24.5 km mark to the 28km mark, effectively cutting their race short by 3.5km. How disappointing, especially for the first timers. By now I was running with Pip, and we headed back into town via Carrington. Through making enquiries at an aid station, we learned there were no portaloos on course at all. Pip made the decision to go off-course at the rowing club, and I lost her, but picked up Kellie. It was AWESOME to have support from other Night Striders on their bikes out on the course at this point. We headed back around Maryville and back into town. 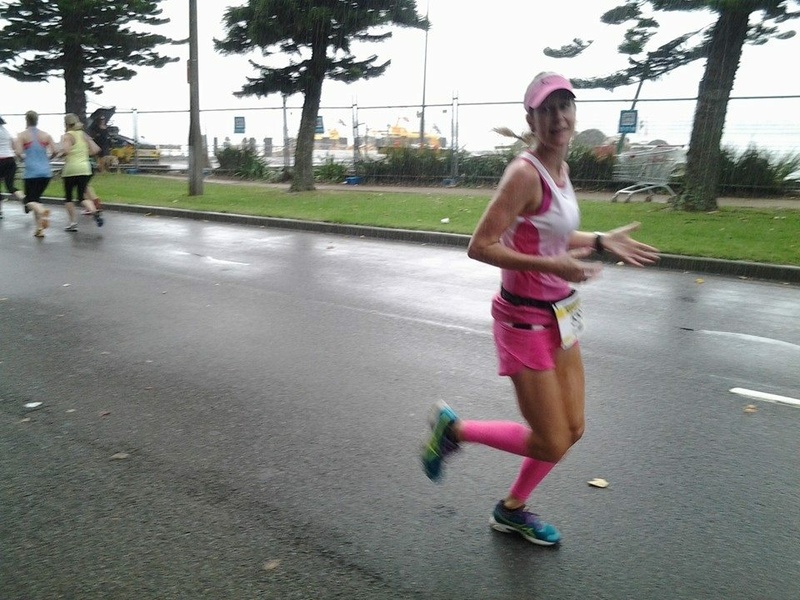 I lost Kellie when she dropped her salt tablets at an aid station, and was on my own for the last 10km, when the rain came. I headed along honeysuckle, and picked up the 10km runners. Suddenly it was a lot less lonely, with lots of slower runners on the course to try and dodge. This probably would not have Been a problem if our race started on time. 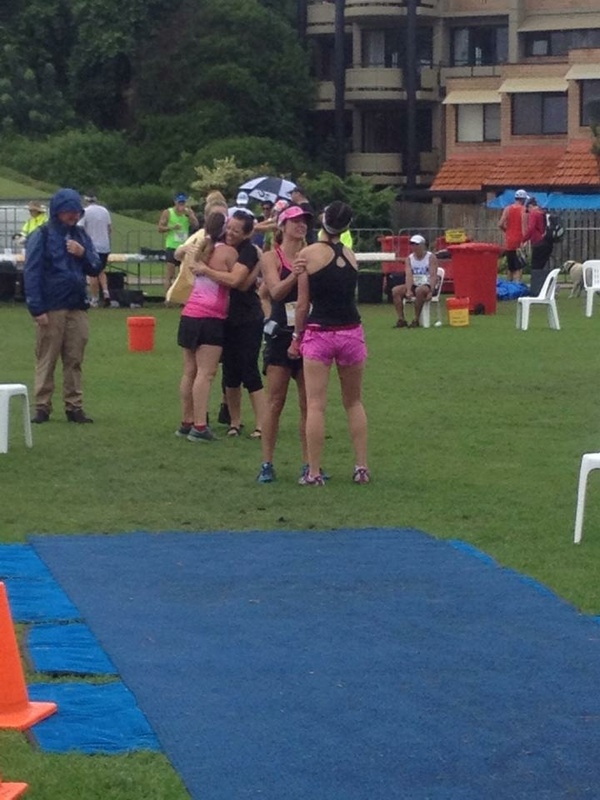 I passed my family, cheering me on in the rain. 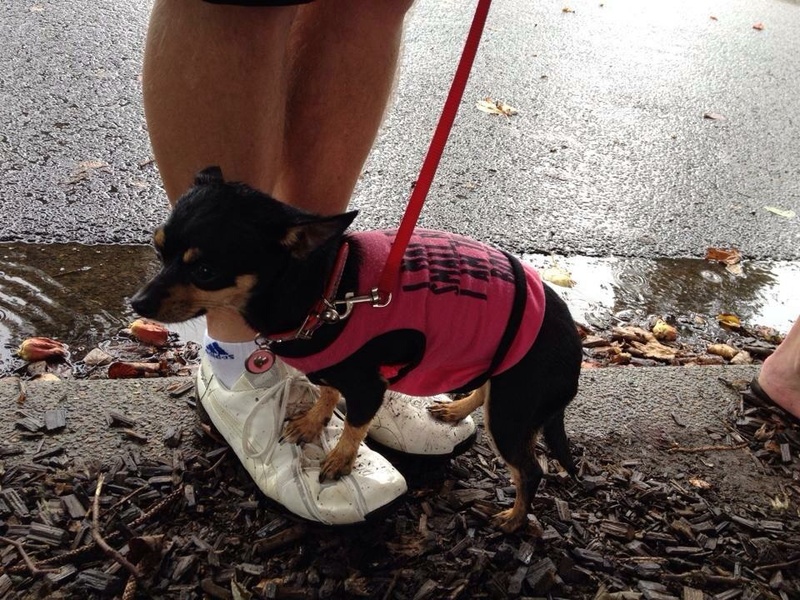 Tequila the chihuahua doesn’t look happy to be a spectator today. I ran past the finish line area, where 10k runners were turning for home. “Which way am I supposed to go?” I asked, and was given directions by a fellow competitor. Runners were going everywhere, and there were no Marshalls in sight. 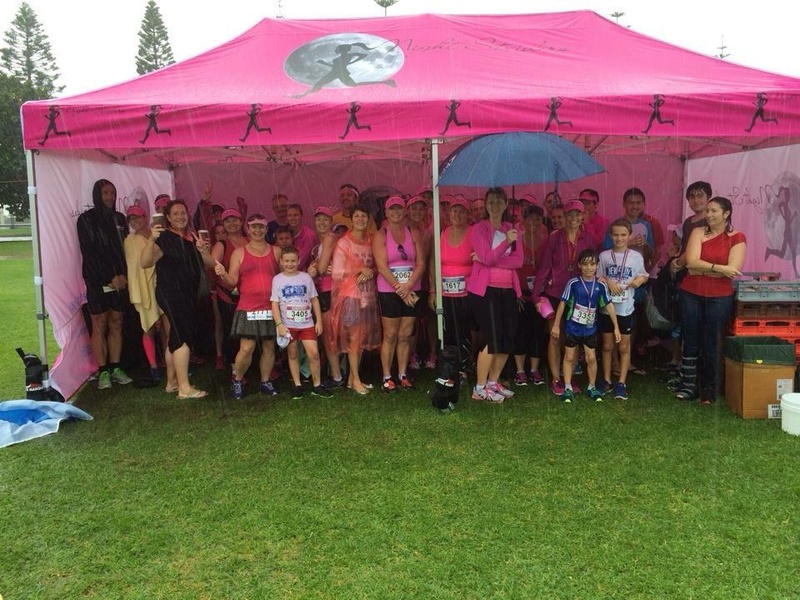 It was fantastic to see Rachael, Bree, Matty and other Night Striders at this point, standing in the rain, in their jeans, cheering us all on. Re-energized, I headed towards the break wall. The strider cheer squad out in force! At the entrance to the breakwall, there were tables of water on both sides, encouraging people to stop on this congested area of the course. This was a bit infuriating. I proceeded up the breakwall, which was jam-packed with slow 10k’ers and half marathoners. I felt really rude asking them to please keep right, but it was frustrating that they were walking 2 or 3 abreast on this narrow section if course. “MARATHONER COMING THROUGH! I have already run 35km and my legs are jelly and I can’t dodge you… All my energy is going into propelling me in a forward motion. A side-step is not an option”. Thankfully I passed another runner I knew, and asked directions on where to go after the breakwall, otherwise I would have had no idea. I headed around towards Newcastle baths, making the 8th dead turn of the course, and then back up the breakwall again. By this stage, the torrential rain was blowing in sideways. I removed my visor, to prevent it from being blown into the ocean, and placed my hand on my stomach, to prevent my bib that was flapping in the wind from blowing off. The second break wall lap was even more frustrating than the first, with even slower runners and walkers congesting the course. The water station had run out of cups by that stage too. Off the breakwall, with my Garmin telling me I had 1km to go, I headed down towards the final turn for home at the Crowne Plaza. My shoes had put on at least a kilo each in water as I squelched through all the unavoidable puddles. I made the final turn, with my watch telling me that I was already done (42.2 km complete) and headed for the finish line. I enjoyed my sprint up the chute with a fellow marathoner, the best way to finish a race, in 3 hours 57 minutes, in line with my plan of a just-sub-4-hour-marathon (actually, 43.3km ultra marathon by my watch) in preparation for Boston. Across the finish line, there was no-one. No officials, no Marshall’s, no one to tell you where to go or place a finishers medal around your weary neck. Worst of all, there was no medical team on hand for anybody requiring medical attention, which is downright negligent on the part of the race organizers, and really makes me angry. Come on, this could be a matter of life and death. All to save a dollar. Unable to find an exit, I squeezed through a barrier. There, I was yelled at by a lady who had clearly had one big bowl of cranky for breakfast. “Don’t you take another step further” she said, “you have to remove your timing chip”. In her defence, I probably would have not been in the best mood standing around in that weather either, but it was not like there were any Marshall’s at the finish line telling people what to do or where to go. Usually there are volunteers to help you with this. Having just run 43km, I’m not really capable of bending down and untying my shoes… My legs have other ideas. Collapsing in a heap is a more likely scenario. I searched out my finisher’s “medal” (more like a keyring on a string) and headed for the Strider tent, where the support was and vibe was fantastic, with everybody encouraging each other and cheering each other home. 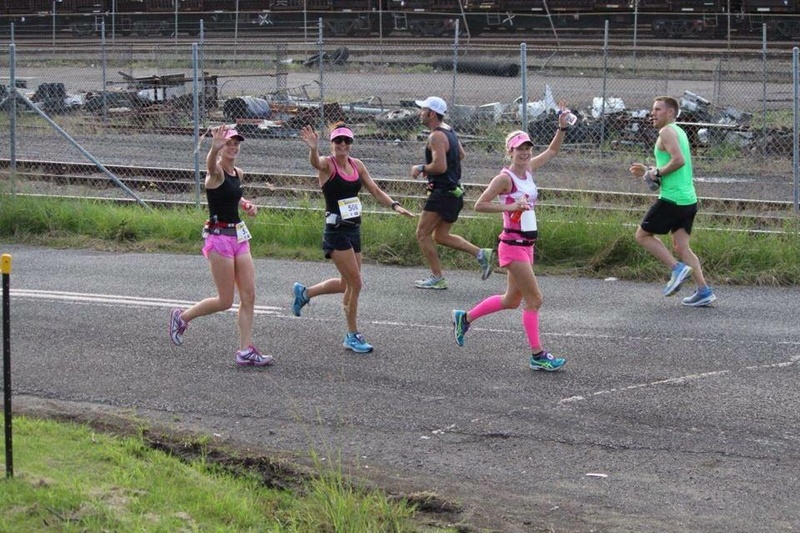 I was reluctant to post this blog, not wanting to sound like another whining runner. Let’s be honest, nobody likes a whinger, not even other whingers. However, after reading many other posts on online forums this week, I realized I am certainly not alone. One runner posted ” Today was my 99th event of at least marathon distance and today’s poor effort would put it in the grand final of poorly organised marathons I have run” Well, I’d go further, I think it just won the grand final, in a spectacularly one-sided game. What is most disappointing, is that all of the complaints I have made about this race were pure cost-cutting decisions to give the organizer more dollars in his own pocket. 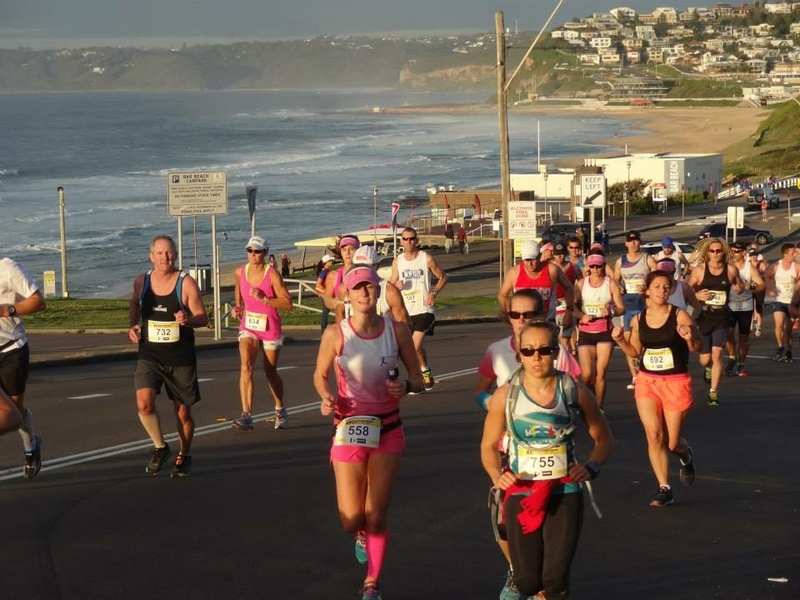 At $130 for an entry, the fee is on par with a big-city marathon like Sydney, Melbourne or the Gold Coast, where you actually get the value out of your marathon dollar. I am disappointed and embarrassed that this poorly organised event was my hometown marathon. If a small community event is what you’re after, instead of the big city marathon experience, I recommend Mudgee or Macleay River, where entry will cost you between $65-$80 and you’ll be unlucky if you leave without a prize. The worst thing is, if this event is on again next year, I will probably run it, because I love marathons, and unfortunately these guys get away with running bad events because there is no competition in this town, and no-one yet has stepped forward to put on a good one. Come on Region of Runners, surely there is someone out there who could put on a better event than this. The bar hasn’t been set… It’s still lying on the ground. I could only imagine how frustrating it would have been for anyone running either the half or full marathon. I ran the 10km with my sister Lauren in her first event so we were one of the slow 10km people but I had similar thoughts about the event. For starters they didn’t have Lauren’s bib number and kept asking her “are you sure you haven’t picked it up”. The congestion at nobby’s and the break wall was pretty bad and I felt for all the marathoners. Hopefully they will learn from this years experience and improve for next year. It was great seeing you out there Rach! I hope your next event is better-organized. Nothing wrong about complaining about a poorly organized race…. and this race sounds like it deserves the criticisms it’s getting. Sadly have to agree with your sentiments Kirby. 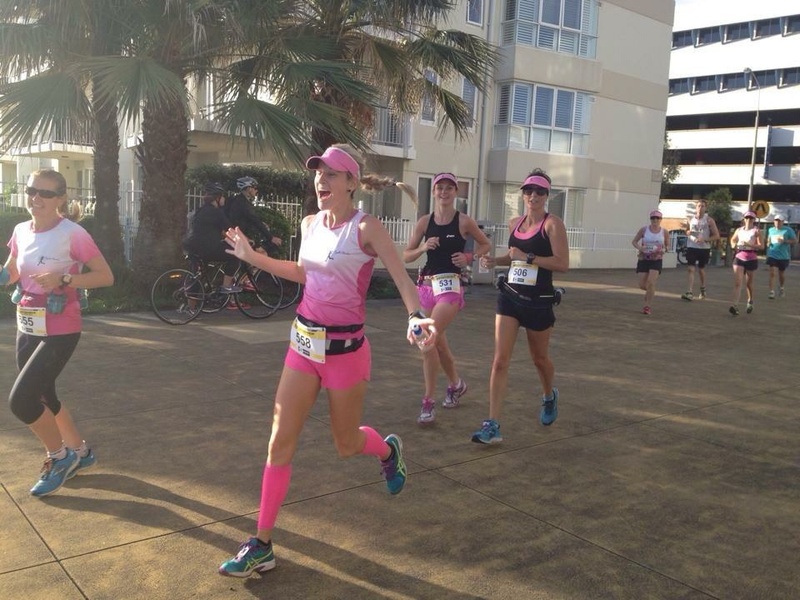 I was never going to run this event as I feared it would be like you described …… I’ve seen the same mistakes year after year and its even worse to mess with marathoners who are facing etreme fatigue. Even as a spectator I was getting angry at all the things i could see that were not going right for the runners. 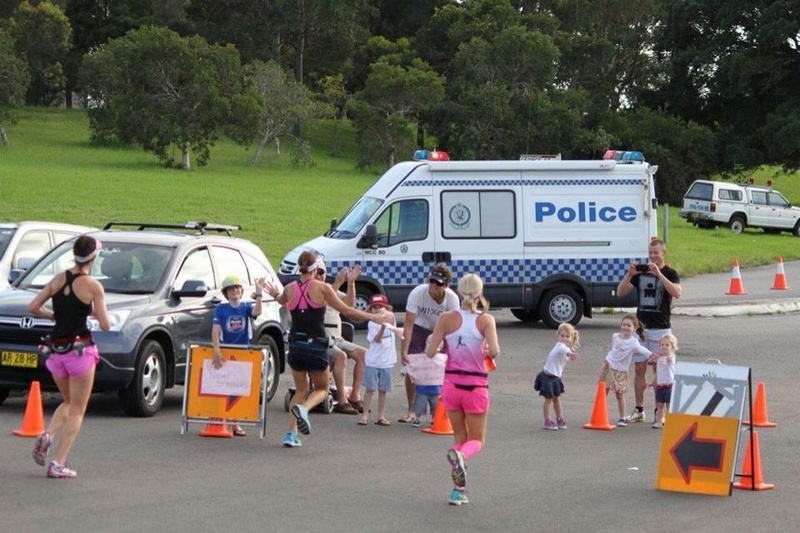 parkrun seems to take weekly 5k FREE events much more seriously. I know, I knew it would be exactly like this and I still entered, most of the problems I saw didn’t come from ‘teething problems’ but simply from poor planning. Moving forward, I hope they can take the criticism and improve the event…. Or….. Do I feel a parkrun marathon coming on? Thank you Karen. There were many things I could have mentioned, but chose to restrict it to those factors that were well within their control. can’t wait for Boston! Like you, I will probably run this race again next year, but I hope that it is a lot better experience that it was this year. Really enjoy your blog and I hope that Boston was a excellent experience.. Thanks John. It was great to read your blog, and yes, Boston was amazing!